Myron Cretney has lived many years in the mountains of southern Oregon, playing music, writing songs and learning from nature. He enjoys learning and teaching earth-based living skills with people of all ages. Exploring ways we might live more sustainably (both socially and environmentally) is of ongoing interest for him. I sat down to talk with him about his first book. 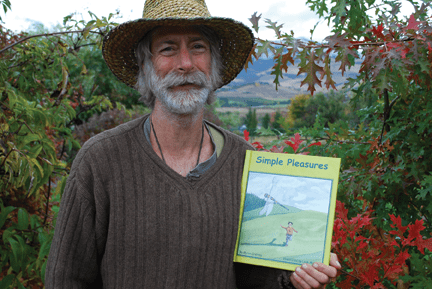 Your book Simple Pleasures came out of a song you wrote in 2008. What was your motivation behind the original song? My motivation was to promote a greater appreciation for the earth and our lives, to encourage all of us to enjoy life, each other and our surroundings, to avoid the trappings of excessive materialism, financial debt and the resulting dis-ease/discontent it can cause. My wish is that we all feel enriched, satisfied and empowered by direct contact and interaction with all the plants, animals and geographic features that exist all around us. Your song is now a book. What was the process of getting it into its final form? The concept of the song becoming a book definitely came alive the first time or two I sang it, and maybe it was even brewing as I wrote the lyrics. How did you decide to work with Leah Mebane as the illustrator? It was a couple of years before I found the illustrator. I had met Leah, but had only seen some of her abstract paintings and hadn’t considered her for the book project. I created a rough draft booklet on some scratch paper, 24 pages or so, and made some basic sketches on some of the pages. At one point, I had approached six or eight artists with my book concept. Then I saw some of Leah’s portraits and decided to contact her. We met. I sang her the song, showed her my sketches and looked at more of her artwork. Leah agreed to do some preliminary sketches. A couple of weeks later, I saw them and loved them! Because Leah was busy with her young baby and other commissioned artwork, it was a gradual process of 15 months or so. In October of 2011, I received 26 beautiful watercolor paintings that have become the illustrations in my book, Simple Pleasures! Why did you choose to self publish with a local printer? In the process of looking at children’s books in the library and bookstores, I was shocked to find very few books printed in the U.S., or anywhere in the western hemisphere, (2% or less of what I saw). I imagine far fewer are printed within 100 miles of where they’re written. I realize this is a cost driven trend. Because I am interested in cultivating what seems more sustainable and feels more empowering for us as individuals and as communities, I decided to research printers in my area. After exploring various options, I developed a working relationship with C.D.S. publications in Medford and am very happy with that choice, (approximately 24 miles from where the book was conceived). By having my book printed locally, I am offering people work here where I live. This strengthens our community, reduces the environmental impact of the process and benefits us all as a result. Where can people get copies of your book? Hardbacks cost $17.95 and paperbacks are $9.95. Yes, it’s available at www.myronaturals.com and so is the sheet music. How can people find your other products? My other products include tincture presses, lotion bars, and beeswax which are all available at www.myronaturals.com. My lotion bars (moisturizing bars) are also available locally at Ashland Food Co-op, Ashland Shop ‘N Kart, Market of Choice, Ashland Outdoor Store, Websters Handspinners, Weavers, & Knitters, Madrona Healthcare, and Phoenix Organics. What classes do you offer and where can people get more information about them? I have been teaching classes locally and at many traditional and primitive skills gatherings through the west over the past decade. Some of the classes I’ve offered are: animal processing, various types of basketry (willow, cattail, tule and more), finger weaving, friction fire, natural fiber cordage, pole peeling and bark containers, and more. For information on upcoming classes, or to request a class in a specific area of interest, email myronclasses@gmail.com.